Former St Mirren manager Danny Lennon has been unveiled as the new boss of Clyde. 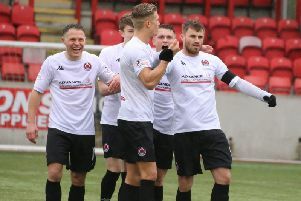 The announcement was made on Monday night that the Lennon would take over the Broadwood hot seat following the departure of Jim Chapman earlier this month. Clyde chairman Norrie Innes said the board had made an “exciting appointment” and said Lennon has impressed at his interview. “Danny spoke with passion and intelligence and he very much welcomes the challenges ahead,” he said. Lennon, who has also managed at Cowdenbeath and Alloa said he was taken by the chairman’s vision for the club. “I like what the board have done and want to do over the next few years,” he said, “I’m more than happy to play my part in that. “Some people might question my ambition in coming to the bottom tier having previously spent time in the top flight, but the reality is that the competition is fierce. “There are a lot of quality managers and coaches looking for jobs and I’m absolutely delighted to be given the opportunity at Clyde.